If you have a gas grill, remember to apply a wire brush and a thin smear of vegetable oil (olive is fine) before and after you grill on it. Light it with the top open, drop the top to allow it to achieve maximum temperature, and then cook on it with the lid down. Always. To understand the reason for this, realise that cooking on a gas barbecue is the equivalent of fiercely grilling something in a hot oven. This is why the cooking times are unique to these devices, and shorter than you might expect. To demonstrate this point, fire up and prepare your gas grill, drop the top, allow it to reach blistering heat, and prepare your favourite cut of steak - a thick porterhouse of, say, 350 grams. Oil and season the steak you have had out of the fridge long enough for it to reach room temperature. Place it at a 45-degree angle to the grill bars, drop the hood and grill for precisely two minutes. Raise the lid, move the steak through 90 degrees without flipping it, and drop the lid for slightly less than two minutes. Raise the lid, turn the steak and repeat the exercise with the second side of the steak, cooking each sector for less than two minutes. Then raise the lid and place the steak somewhere warm (but not hot) for exactly six minutes, tented loosely in foil. Now, eat. It will be a perfect medium rare. 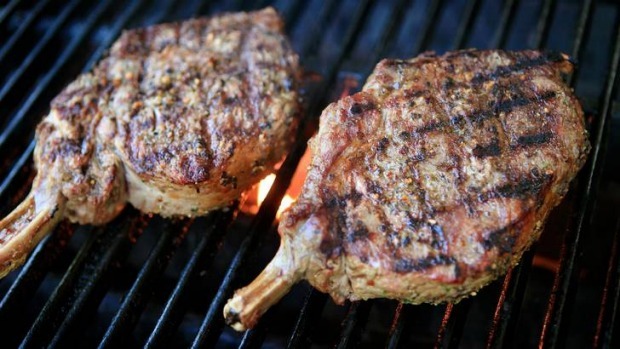 The one dish that will establish, once and for all, that you are an urban griller of distinction, the steak you need is special: seek out rib-eyes on the bone - one between two - of close to 600 grams each. Note this is the only occasion on which you should use a dry rub other than the all-purpose one, and you need to make it, just before cooking the steak, in a mortar and pestle: pound together 50 grams coarse sea salt, two tablespoons black peppercorns, one tablespoon chilli flakes and one tablespoon fresh rosemary needles. Pound to a powder. Oil the steaks, which you have returned to room temperature, and sprinkle generously with the rub. 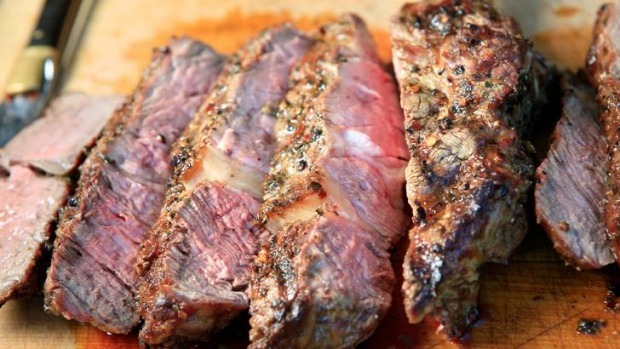 Cook these steaks, using the four-sector method discussed earlier, on a fiercely hot gas grill, for three minutes per sector, or 12 minutes in all. The heat will caramelise the rub and the bars will impart grill marks. Rest the steaks, tented loosely in foil, for six minutes, and then carve, thickly, parallel to the bone. Serve on a mash of sweet potato - roasted, perhaps, at the back of the grill and then scooped out and mashed with unsalted butter and a splash of maple syrup. But remember, once you have achieved perfection by following these rules, there is no going back. No more cooking with the lid open, poking and prodding and cremating blameless beef.